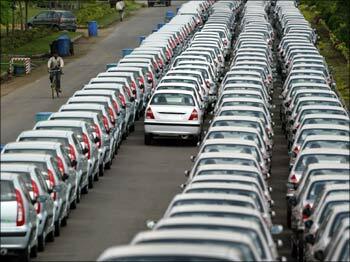 Domestic passenger car sales rose by 19.66 percent to 2,29,866 units in March 2012, from 1,92,105 units in the same month last year. Figures released by the Society of Indian Automobile Manufacturers (SIAM) today also show that motorcycle sales in the country grew by 1.15 percent during the month to 8,50,619 units from 8,40,944 units in the same month last year. Total two-wheeler sales in March increased by 8.27 percent to 11,83,407 units from 10,93,004 units in the same month last year. Sales of commercial vehicles climbed by 14.82 percent to 90,415 units from 78,745 units in the year-ago period, SIAM said. Total sales of vehicles across categories registered 10.11 percent growth to 16,08,216 units in March 2012, from 14,60,498 units in the same month last year, it added.